Looking for a simple breakfast or snack, or even a decadent yet light dessert with the flavors of apple pie? We’ve got you covered. 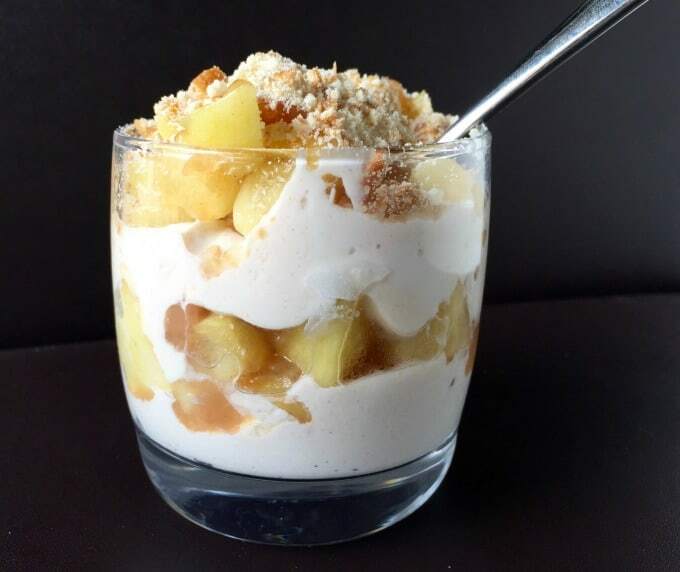 You’ll love this healthy apple pie yogurt parfait. It’s easy to make using simple ingredients with a lot fewer calories than apple pie! Did you know that the standard slice of apple pie has 450 calories? Though delicious, it is not exactly the lightest, healthiest way to start the day. So as soon as I spied this recipe for apple pie parfait in Hungry Girl’s Summer 2018 magazine, I knew I wanted to give it a try. 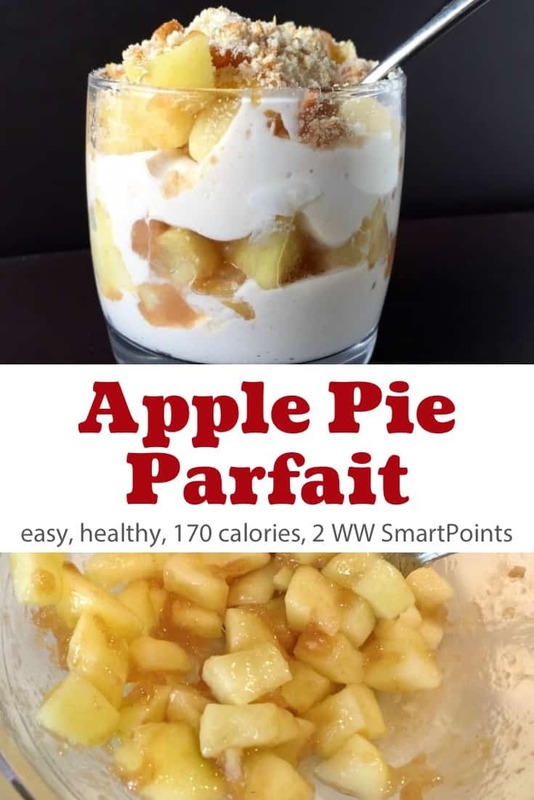 How Many Calories and WW Points in this Light & Healthy Apple Pie Yogurt Parfait? According to my calculations this parfait has 167 calories and 2 Weight Watches Freestyle SmartPoints. Way less than half the amount in a standard piece of pie! This parfait sounds fancy, but it is definitely NOT. The microwave does all of the work. All you have to do is assemble. 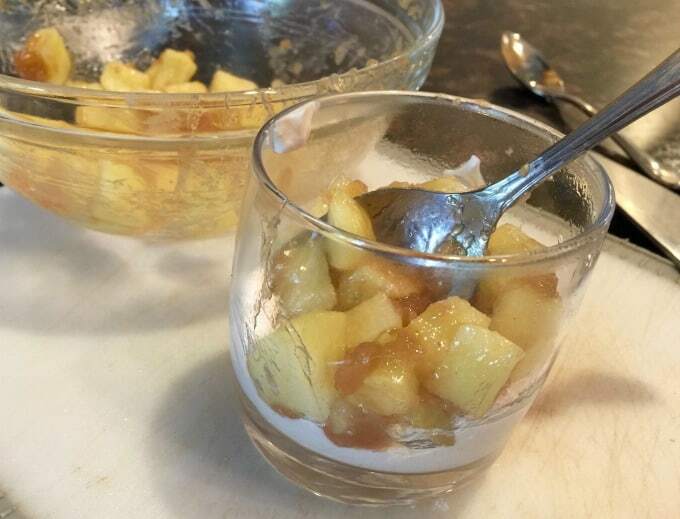 The recipe calls for Fuji or Gala apples, but use whatever apple you like best. I’m a big fan of pink ladies. 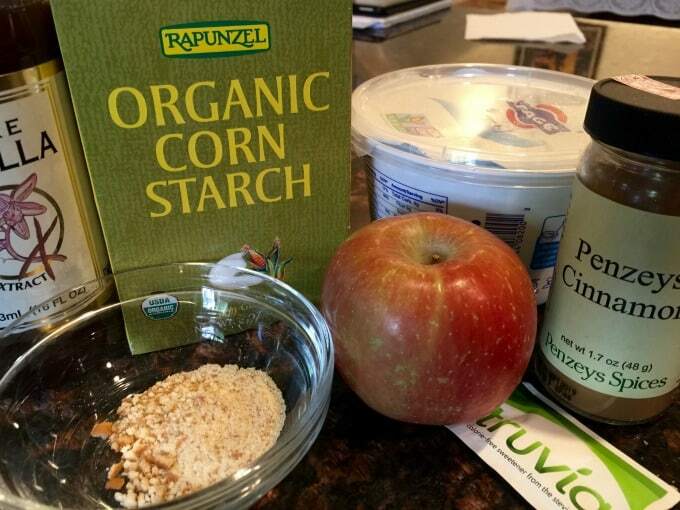 Cornstarch is called for to act as a thickening agent and provide the apples with an apple pie filling consistency. If you don’t have cornstarch you could substitute arrowroot or instant granulated tapioca or skip it altogether. The recipe also calls for graham cracker crumbs, but feel free to substitute whatever you like: a sprinkle of granola, cereal crumbs or cookie crumbs of your choice. If you are not a fan of sweeteners such as truvia (affiliate link), use whatever suits your fancy. Sugar, honey or maple syrup would all work. Just keep in mind that this will change the calories/points. Recipe Variations: Make whatever kind of fruit pie parfait you like best. Peach, pear, blueberry or strawberry all would be delicious. 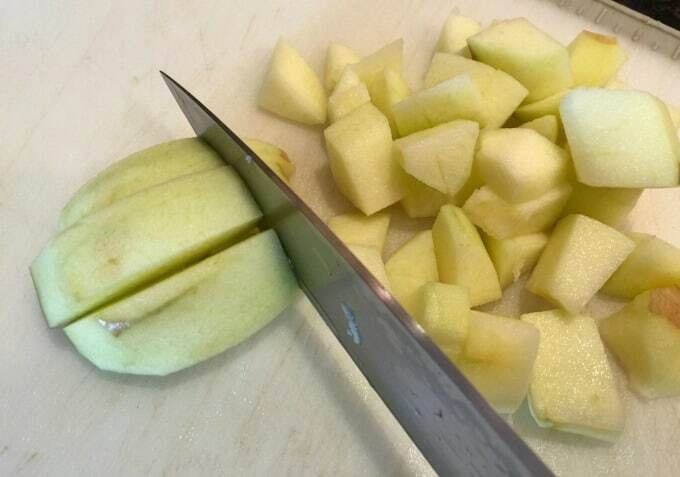 Then you’ll need to peel and chop your apple. And then in a medium microwave safe bowl (affiliate link), stir together the cornstarch and 1 tablespoon water until it is dissolved. The cornstarch water mixture serves as a thickening agent giving your apples an apple pie filling consistency. If you don’t have cornstarch you could substitute arrowroot, instant tapioca, or skip it altogether. 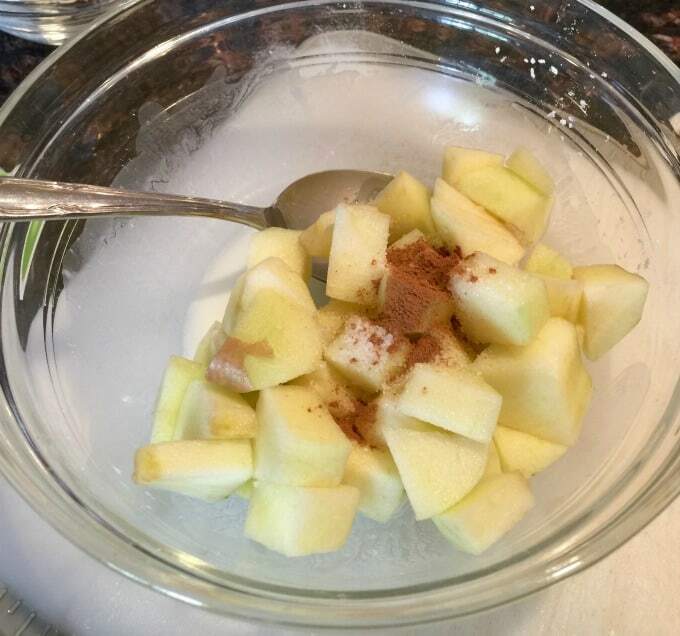 Add the apples, half of the sweetener packet, 1/8 teaspoon of the cinnamon, vanilla and salt. Mix well. Cover and microwave until the mixture is thickened and apples have slightly softened, about 2 to 3 minutes. The time required will depend on the power of your microwave and type of apple you used. In a small bowl (affiliate link), stir together the yogurt, remaining half packet sweetener and 1/8 teaspoon cinnamon until well blended. 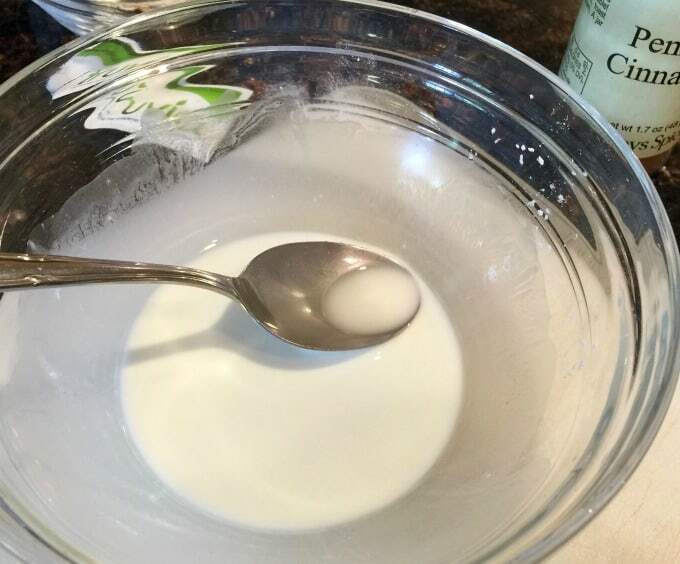 Spoon half the yogurt into a glass. Top with half of the apple mixture. Repeat with the remaining yogurt and apples. Sprinkle with the crushed graham cracker crumbs (or cereal crumbs or cookie crumbs or granola or chopped nuts). And there you have it. You can’t get much better than this. Way easier than pie and ready to eat in less than 10 minutes! 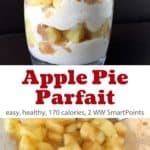 If you’ve made this apple pie parfait, please give the recipe a star rating below and leave a comment letting me know how you liked it. 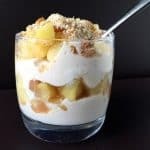 Warm cinnamon scented apples layered with creamy yogurt and sprinkled with graham cracker crumbs, this apple pie parfait is a lusciously light and healthy alternative to apple pie. This recipe would be great for breakfast, dessert or snack time. And it makes just one serving. If you prefer not to use Truvia, substitute your sweetener of choice. In a medium microwave safe bowl, stir together the cornstarch and 1 tablespoon water until it is dissolved. Add the apples, half of the sweetener packet, 1/8 teaspoon of the cinnamon, vanilla and salt. Stir until well combined. Cover and microwave until the mixture is thickened and the apples are slightly softened, about 2 to 3 minutes. 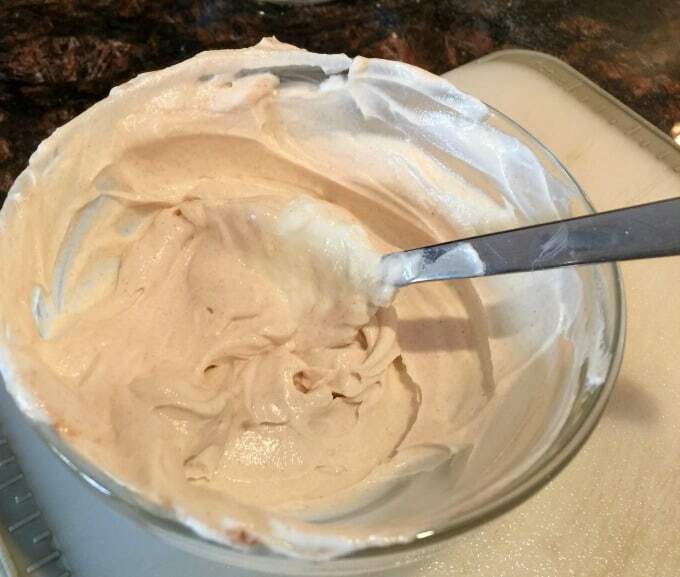 In a small bowl, stir together the yogurt, remaining half packet sweetener and 1/8 teaspoon cinnamon until well blended. To assemble the parfait, spoon half the yogurt into a glass. Top with half of the apple mixture. Repeat with the remaining yogurt and apples. Sprinkle with the crushed graham cracker crumbs. Using just yogurt, applesauce, granola and nutmeg, this is an even easier no-cook version of apple pie yogurt parfait. With just 4 ingredients – apple, yogurt, peanuts and light caramel sauce this yummy parfait would make a delicious dessert. This microwave baked apple, a delicious warm treat perfect for dessert, breakfast or as a mid-afternoon snack, is one of my new favorites. 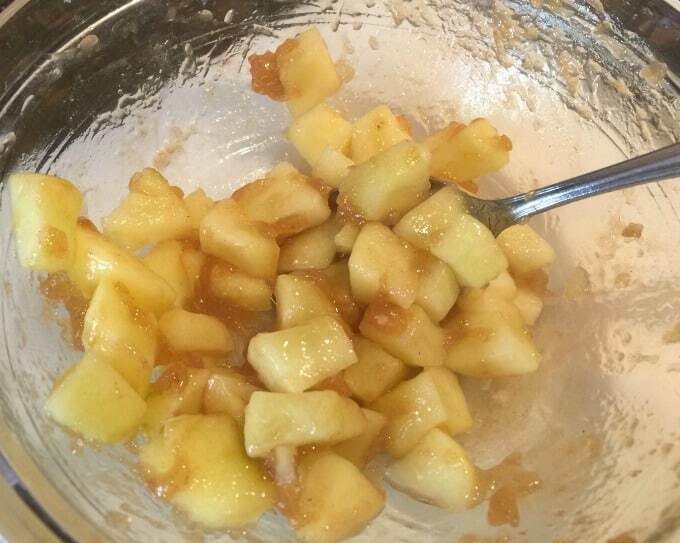 This easy apple compote is a great way to satisfy an apple pie craving for WAY fewer calories and/or Weight Watchers Points! It’s easy, healthy and delicious. Hi Martha – this recipe sounds delicious but unfortunately I don’t,’t have a microwave. Is there any way to make it using stovetop. I love your recipes – I have have the first bundle of your ebooks and use them regularly. I have yet to be disappointed!Between them and your emails, Closing weight and feeling fine!! Thanks Martha! I really appreciate your advice. I’m off to the wilds of northern Ontario for a few days but will give it a whirl when I get back. I’ll let you know how it turns out in case there’s some Luddite like me who might have the same question! This was great! I used a couple tsp. of maple syrup in with the apples and with the yogurt for the sweetner.